With an irresistible beat and haunting vocals, Fly Project is one Romanian dance act you won’t forget very soon. Fly Project are the very talented Tudor Ionescu and Dan Denes and their first single, ‘Raisa’, was one of the most popular hits of the summer of 2006 in Romania. This was just a prequel to their second album which broke all booking milestones, bringing them an unwritten trophy for the most concert bookings in one year. 2008 saw ‘Brasil’, their hit single that featured Anca Parghel & Tom Boxer, skyrockets to the top of international charts, breaking boundaries from Russia to The Netherlands and Greece. 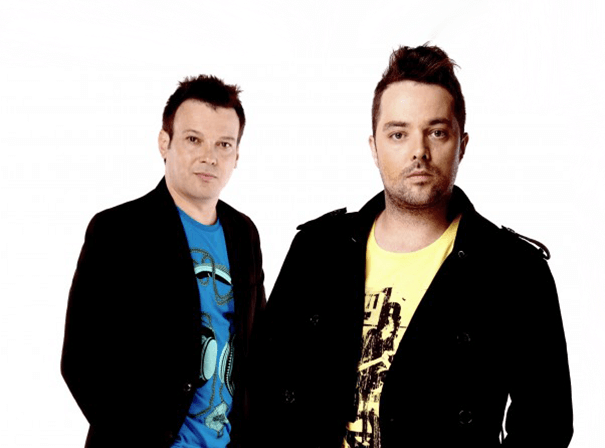 In 2010 they decided to go back to their musical roots and created the hit single ‘MandaIa’, its obsessive vocals that have been a Fly Project trademark ever since their debut making it a smash hit both in Romania and abroad. Recently they’ve taken a new approach — love song, ‘Goodbye’, with its poetic lyrics and crazy club rhythm making it the most listened to track in Romania upon release. As Tudor’s voice chants ‘I’m begging your eyes to cry’, the European, Asian and even African dance scene sizzles with delight, dancing until the morning light. Fly Project is known to have some very impressive, dynamic and explosive shows including a substantial content of entertainment and an exceptional choreography. Till now, Fly Project has performed over 2000 live concerts and has a record of over 10 major Romanian and International Music Industry awards.